At Greenwich Metal Finishing, our craftsmen are specially trained in hand polishing to ensure safe and effective cleaning. Our polishing and buffing services are suitable for any type of metal: brass, silver, bronze, copper, nickel, stainless steel, pewter, gold, and aluminum. All work by Greenwich Metal Finishing is done on premises and is insured against damage or loss. In addition, each item is documented and identified upon receipt. 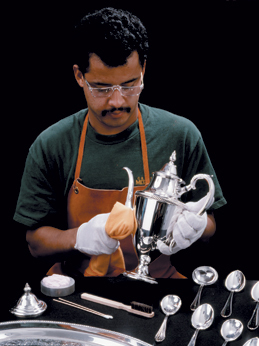 Once polishing is complete, each piece is wrapped and sealed carefully to protect it. Let Greenwich Metal Finishing bring added luster to your weddings, parties, and corporate events. From flatware to decorative ornaments, we can add a luxurious gleaming touch. Greenwich Metal Finishing can disassemble, polish, and lacquer brass headboards and footboards. Our on-premise machine shop allows us to fabricate any missing or damaged finials, tubes, or ornamental pieces. We also specialize in custom finishes. Greenwich Metal Finishing offers pickup, delivery, and installation services within Fairfield, Westchester, and Putnam counties, New York City, Northern New Jersey, and Long Island. If you are outside our local area, we can arrange professional crating and transportation.